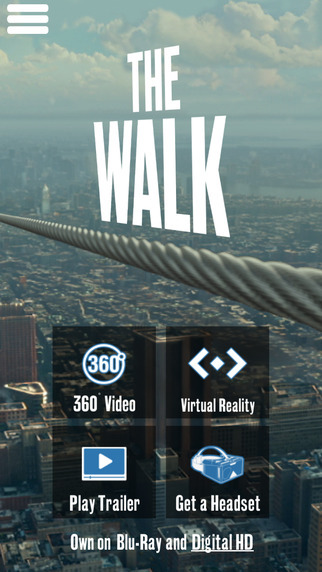 In conjunction with the release of The Walk on Blu-ray 3D and Blu-ray Disc today, Sony Pictures Home Entertainment has released The Walk VR Experience App for Apple iOS and Google Android devices. When used with compatible Merge VR Goggles or Google Cardboard, viewers can experience what it’s like to balance on a tight rope 94 stories above ground, as did daredevil Philippe Petit in 1974 when he crossed New York City’s Twin Towers. Those without VR glasses can also use the app to view a 360 video with a birds eye view of New York during the time period by simply using their mobile device. Too realistic? Sony suggests only using The Walk VR Experience with Merge VR Goggles or Google Cardboard glasses while sitting down, and, to follow all instructions included with the compatible VR device. The app is free to download, but may only be available for a limited amount of time.